How is the sexual life of the Portuguese affected by their professional life? 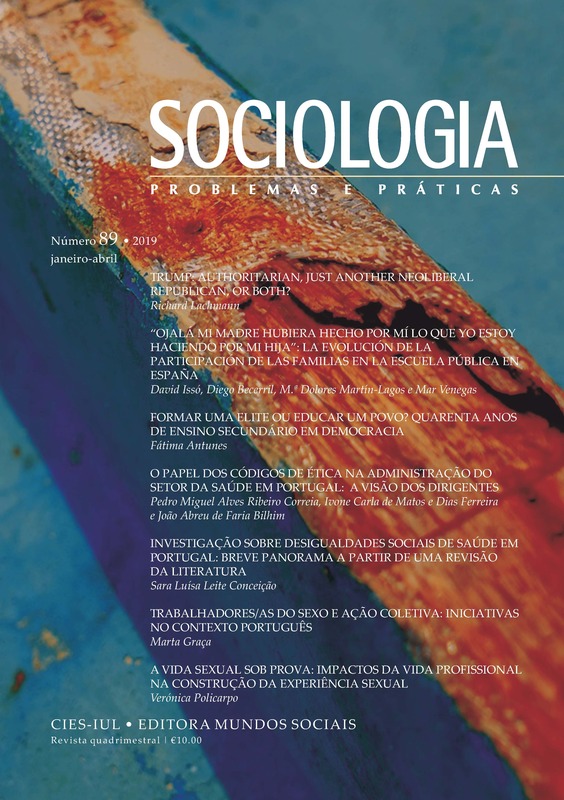 This article addresses this question drawing on 35 sexual biographies, collected during a wider research about sexuality in Portuguese society. Drawing on the concept of sexual experience and social proofs, the article tries to understand how individuals articulate their experiences in these two spheres of personal life (professional and sexual), building their sexual experience from three different logics of action: integration, strategy and subjectivation. Results highlight the diversity of modalities in the construction of experience, visible in three platforms: the relations between the professional agenda and the sexual agenda; the management of information regarding experiences beyond the heteronorm; and the impacts of geographical mobility, due to professional reasons, on sexual life. The sexual subject is thus constructed in the tension between how individuals adhere to social roles (family, professional and sexual); how they manage their resources, opportunities and strategies in these spheres of life; and the way they distance themselves reflexively from the latter, conquering for themselves an emancipatory space of identity.